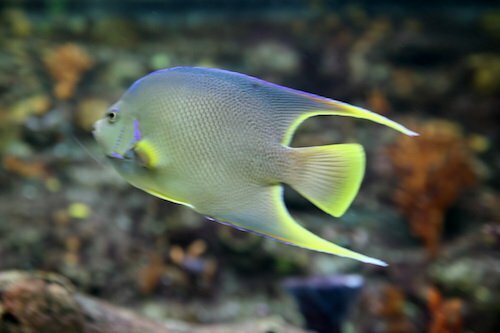 Saltwater angelfish are highly sought after for the saltwater aquarium enthusiast because these fish come in a wide variety of sizes and stunning color patterns making them exquisite living decorations in the home tank. This article we’re going to talk about the Blue Angelfish (Holacanthus bermudensis), which is sometimes called the Bermuda Blue Angelfish. The Blue angel is another beautiful variety that has long tail fins, making for graceful movements as it swims through the water. The colors of this fish are also striking with a mix of blue/green over the body and a yellow face. Watching this fish glide through the tank is as relaxing as it is impressive. It gets the name Bermuda Blue because it is found in the wild mostly in Bermuda, but in actuality this fish can be found throughout the Gulf of Mexico all the way to northeast of Bermuda in the Western Atlantic Ocean. The Blue Angelfish is very similar in appearance to the Queen Angelfish — so much so that the two are often confused with one another. An adult Blue Angelfish can grow upwards of 15 inches, which means you’re going to need a large tank; 180 gallons or larger. This fish is known to be aggressive and will bully other fish. Keep this in mind if you’re planning on housing these with smaller tank mates. Housing these fish with other angels shouldn’t be a problem provided you have a large enough space (over 220 gallons) so they can each have their own territory and won’t be having too many run ins with one another. 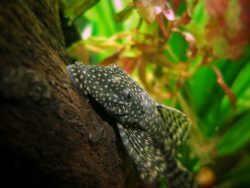 These fish need plenty of hiding places to duck into in case they feel threatened, so plan on including plenty of rock work in your tank, both live and otherwise. Be careful, though, not to put in too many rocks that might crowd this fish because they do need plenty of room to swim. The Blue Angel is not safe for reef aquariums and the adults will destroy any corals you might have save for the most toxic corals coming from the family Alcyoniidae or Octocorals. If you have crabs or shrimp they should be okay. As with most saltwater angelfish, the Blue Angelfish needs good quality water in order to keep them happy, healthy and stress free. Water temperature should range between 70˚ – 82˚ Fahrenheit with a pH range of 8.0 – 8.4, medium water hardness, and a specific gravity of 1.023 – 1.025. It is also recommended that you perform regular water changes of 10-15% every two weeks for tanks in the 180 gallon range and 30% every 3-4 weeks in tanks over 250 gallons. It’s also vital that you maintain consistent, high quality water conditions because allowing things to get out of control or to change rapidly can cause stress to the fish, which can lead to disease and eventually death. In the wild the Blue Angel likes to graze on algae, so be sure you have that established on the rock work in your tank before introducing these fish and be sure to have adequate lighting to encourage algae growth. 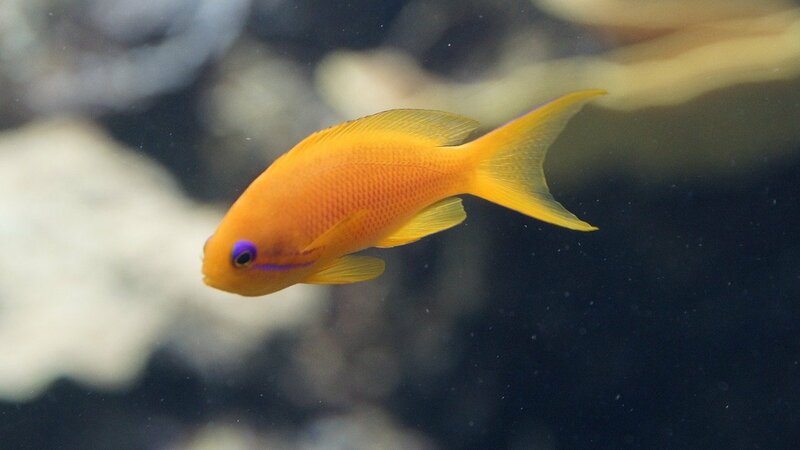 It’s also recommended that you employ a daylight bulb to help the angels to absorb vitamins A and C.
The Blue Angelfish is a fairly hardy fish, and they should be no problem for the intermediate and advanced hobbyist, however, they are prone to several diseases and parasites as are most species of saltwater angelfish. 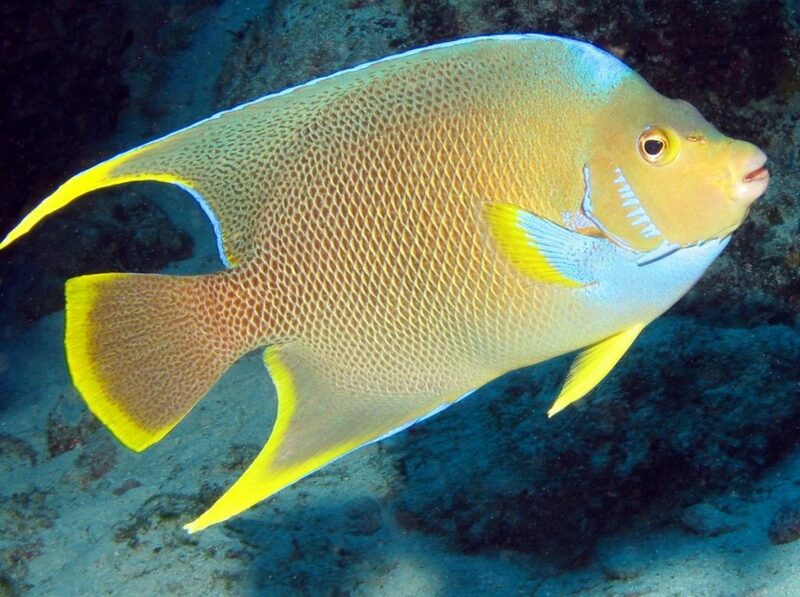 The most common disease plaguing the Blue Angelfish is White Spot Disease (Cryptocaryon irritans) also known as Marine Ich, Saltwater Ich or Crypt. This disease manifests as white spots that cover the body and a peculiar ‘scratching’ behavior. 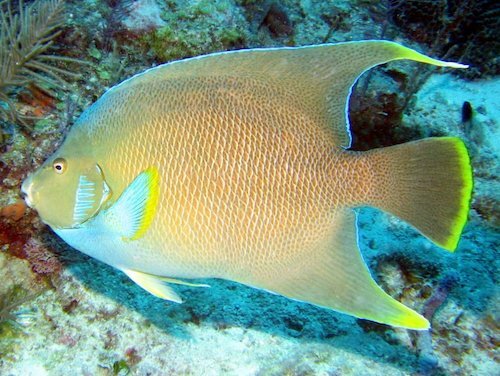 Another common disease affecting these fish is called Marine Velvet (Oodinium ocellatum). This is a parasite and symptoms manifest in a brownish, dust-like coating that covers the body, hence the velvet name. Other symptoms include clamped fins, difficulty breathing and clouding of the eyes. While these and the other diseases affecting these fish are common, and can lead to death, they’re also very preventable. Stress is the leading cause of disease in fish so make sure you give them plenty of places to hide, a high quality diet, and stellar water conditions and you should have no trouble keeping these fish healthy for many years. 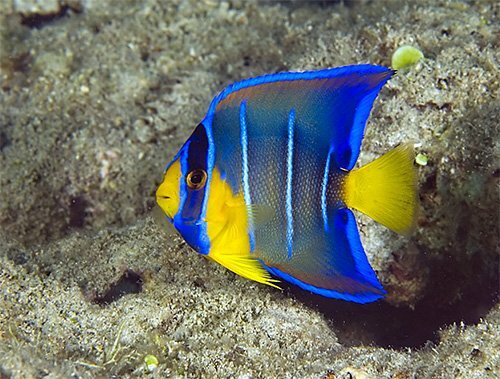 As with most saltwater angelfish, the Blue Angelfish is an omnivore and will eat both plant and animal matter. In the wild, the adults eat mainly sponges and algae. In the home set up they will do well on a diet that includes sponge material — either in flake or pellet — as well as vegetables such as uncooked broccoli, which is a good source of vitamin A and C. You can also give them meat treats on occasion such as brine and miss shrimp. Be sure to remove any leftover food as quickly as possible to maintain good water quality. It’s recommended that you feed these fish several small meals throughout the day as opposed to one large meal. As of this writing, breeding the Blue Angelfish in the home environment hasn’t been accomplished. Tank size: 180 gallon minimum 250 – 300 recommended. The Blue Angelfish is a beautiful and graceful specimen that can make a great addition to your home saltwater setup. They’re a very hardy fish and will do well provided you give them the care and attention they need, and house them with the appropriate tank mates. With proper care, these fish can live up to 20 years or more.